by Taking Action Today Managing Finances Isn't Easy. That's Why We're Here to Help. As fiduciaries, we have been developing investment & retirement solutions for clients of all ages. Request your free, no-obligation consultation today! Need professional help with your wealth management? Call (888) 496-1665 for an initial free confidential consultation. We can't always know what the future will bring, but we can prepare to the best of our abilities by having a solid plan in place. When it comes to your wealth management matters, having the right plan and investment portfolio is crucial to securing financial stability in the future. You have worked hard to attain the life you envisioned for yourself and your family. Don't jeopardize everything by failing to plan for the future! Allow us to help you maintain this quality of life throughout your retirement. Our financial advisors in New York would be happy to answer any questions you may have about long term financial planning and investments. With offices in Midtown Manhattan, and Melville, Long Island, our Nassau County firm proudly serve clients in Suffolk County, New York City, and throughout the country. A financial advisory team with a total of more than 25 years of experience. Independent fiduciary advice regulated by the federal government. 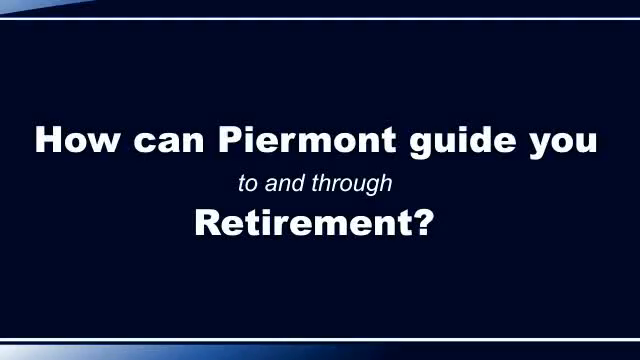 Whether you are retired, about to retire, or are still saving for that chapter of your life, the New York financial advisor firm at Piermont Wealth Management can help you create and implement the right investment strategy that will generate the retirement income amount you desire. Our services include: retirement planning, investment management, and financial planning. Assessing risk tolerance from the start, this process enables us to create a financial plan that works best for you. Our wealth management team will then meet with you periodically to discuss any possible adjustments to your plan and confirm that your goals are being completely satisfied to your liking. Don't to Plan for Your Future. At Piermont Wealth Management, we strongly believe that independent, fee-only advice yields the best financial solutions. It comes from our long-standing philosophy of providing ethical, conflict-free service and placing our clients' needs first. This is why we do not receive a sales commission for our services or try selling a financial product to our clients. As a fiduciary, we are completely independent, objective, and commission-free, and are registered as such with the U.S. Securities and Exchange Commission (SEC). As our client, you deserve trustworthy and comprehensive financial planning services. Our certified financial advisors are ready to serve you and your best interests.